Welcome to day six of Knitting and Crochet Blog Week. For today’s topic, I am writing about a knitter I admire: Alice Starmore. Alice Starmore’s work is true art. Her patterns are not only lovely, they also seem to express ideas. They have a voice and story inside them. Alice Starmore was born in Scotland on the Hebridean island of Lewis. Her family worked as fishermen and spoke Gaelic at home. In 1975, she became a professional textile designer, her work heavily influenced by the fiber crafting traditions of her home. She immersed herself in the textile traditions of Scandinavia and began to write books of knitwear patterns. 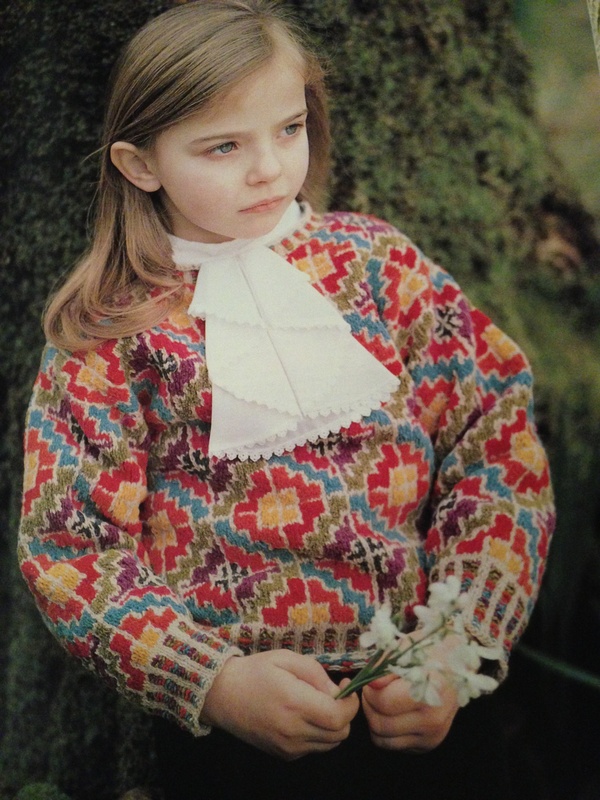 Her first book, Scandinavian Knitwear, was published in 1981. This book was followed by 17 others, as well as variety of other publications. Today, Alice Starmore is world-renown as a knitting expert. Her books on Fair Isle and Aran knitting are regarded as standards in the literature. How I Came to Love Alice’s Work e subjects, and she has taught and lectured extensively throughout Britain, Europe and the USA. I was first introduced to Alice Starmore’s work while searching for boyfriend sweater patterns. I drooled over several gorgeous cabled sweaters, but wisely decided to tackle a simpler project. I was ambitious as heck, when it came to my knitting, but not deluded. I still have a few of those patterns in my “some day” pile. I’ll know when I’m ready. The patterns I’m really enchanted by, though, even more than the cables, are the colorwork. I’m just blown away. Lindisfarne Sweater by Alice Starmore, as seen on Ravelry and in The Celtic Collection. This last December I happened up on a copy of The Celtic Collection in a Friends of the Library shop. I snapped it up. I had no immediate intention to knit anything from it, it was just something I had to have. A piece of raw inspiration to feed my creativity. Like a book of Da Vinci sketches or a print of Monet’s water lilies. I read the book in bed, some nights, lost in the world trapped between the pages. It may seem a bit odd to pay tribute to this artist’s work in a non-fiber medium. But I was fascinated to see how well the intricate Fair Isle patterns could be translated into rows of colored PVC bricks. I started with one of the simplest patterns in The Celtic Collection, a child’s sweater called Ardagh. Ardagh Child’s Sweater in Celtic Fretwork. Photo of page 47 of The Celtic Colelction. I chose a small section of Chart A for my experiment. I used a combination of different types of tiles and plates. I tried to choose colors close to the yarn colors used in the sweater. Some color matches were better than others due to the colors available in our home Lego supply. 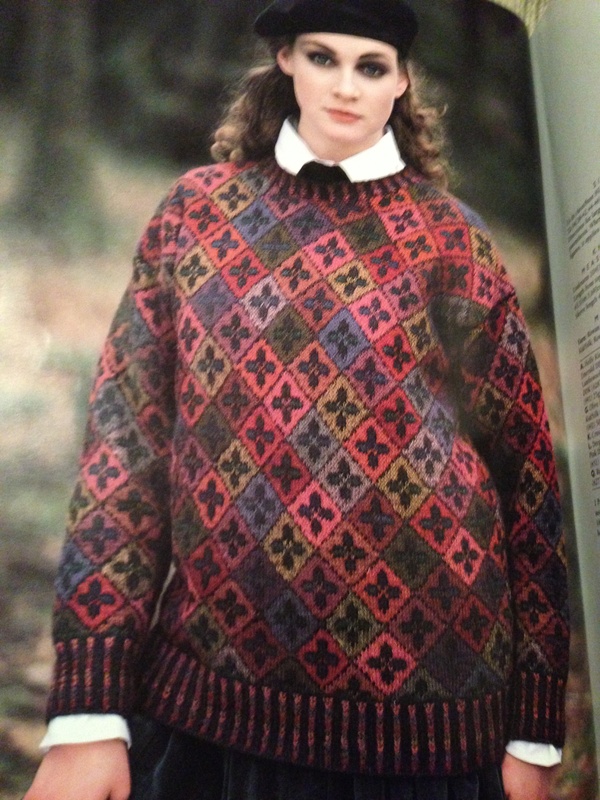 Next, I tackled a slightly more complex pattern, the Kells sweater. 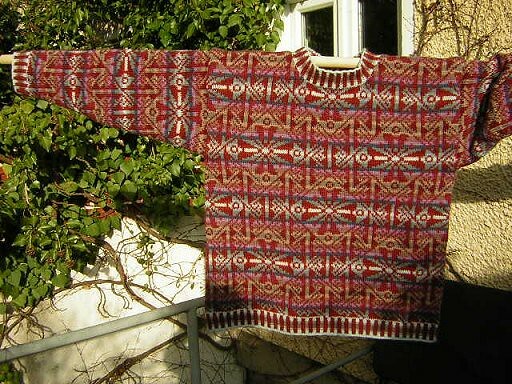 Kells sweater by Alice Starmore, as seen on page 50 of The Celtic Collection. Early on, I attempted to render one of the more complex Fair Isle sweaters in Lego, but had to quit due to a shortage of pink and purple plates. I won’t deny it, I spent an entire Saturday afternoon playing with Legos. Playing with legos and not knitting. 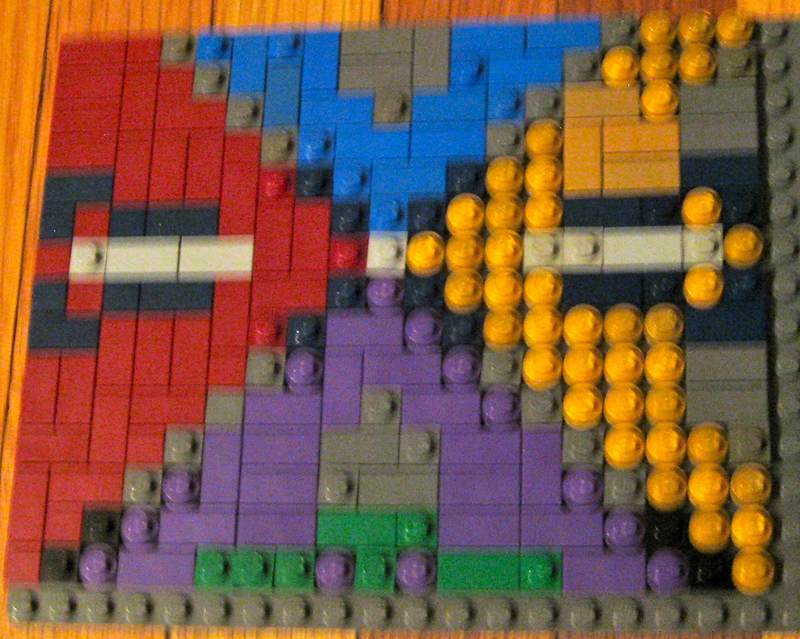 What I learned is that Legos can provide a very useful medium for trying out new patterns and color combinations. It doesn’t necessarily take less time than swatching. In fact, it probably takes a lot more time. 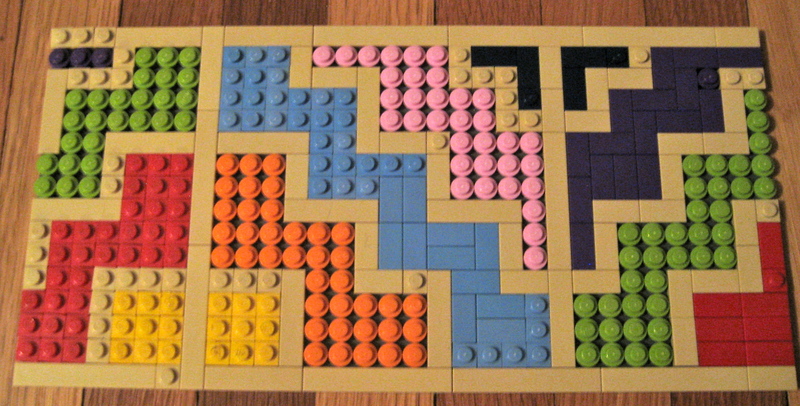 But the advantage is that you can reuse Legos over and over in infinite combinations. And you’re not limited by the colors of yarn you happen to have on hand, only the colors of your Legos. It’s true that, in this experiment, I ran into some issues with the colors in my Lego supply. But that was because I had not planned to use Legos in this way. The Lego collection belongs to my husband. He buys his bricks with shape in mind more than color. Were I to invest a little money, I could amass a collection of colored plates and bricks exclusively for color work experimentation. And baby, you’d better believe me when I say, there are lots of options out there. Take a web-walk over to Bricklink sometime. I recently took a class in Norwegian stranded color work and am absolutely obsessed with Selbuvotter mittens. This is, perhaps, a better application of Lego experimentation than the Alice Starmore sweaters. One could actually construct a complete mock-up of a mitten (minus thumb) in Lego before knitting it. Also, perhaps more helpfully, one can play around with various different motifs in a very modular way, swapping things around until you get a sequence that pleases you. Here’s a current experiment in progress. OMG, this is the best blog post ever. Love! 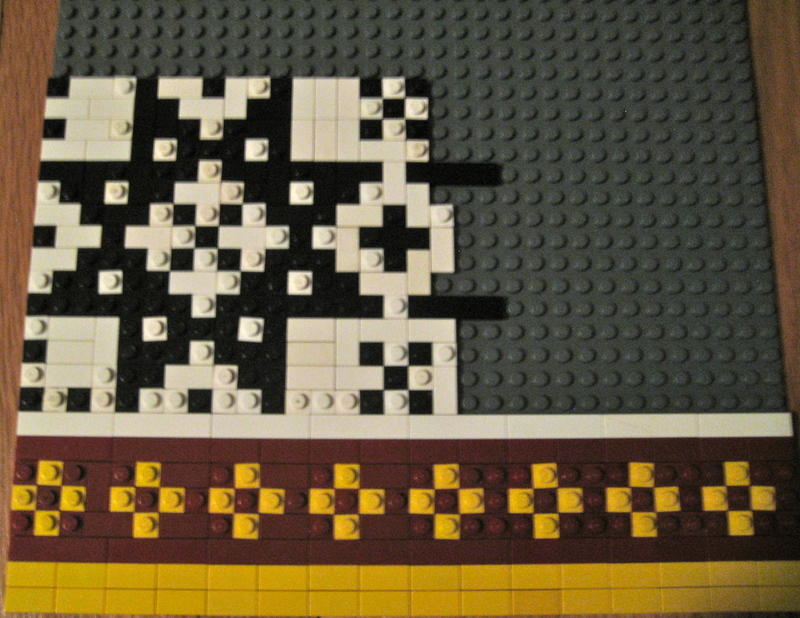 I love the idea about using Legos to help layout a fair isle design. I am totally fascinated with the Lego experiment. I have worked out designs using those magnetic squares, but this is far more interesting. I am a big fan of Alice S. as well. Her new book on the Tudors is inspiring me. I doubt I will ever knit one of the beautiful sweaters, but I may use a piece of a pattern in a sock! Lego! Now I know what I might do with the Lego once it’s boxed up and put away here at my house. Genius! And fun! Thanks. It is fun. Do you have your Legos organized at all? It helps to sort things out into appropriate sizes and colors first. Otherwise finding what you need can be a bit frustrating. Thanks. We had a big bucket of them when I was little. I used to build houses for The Littles and leave them out at night. Now that is a very good way to use Lego! Briliant! Beautiful patterns – like carpet ones ! So lively ! To quote my husband: “fabulous blog post” Looks like we might copy the idea (there is more than enough Lego in the house …). Cool. I’m interested to see what you make. Legos = brilliant! Definitely on my list of things to try now. Q – Not sure how I missed this post. One of your best! Next time I’m at the kiddos I know what to do with their Legos! Living close to a Legoland you’d think that I’d have thought of it. LOL!